The Adelaide Crows soared to a 45-point win over the Carlton Blues at the Adelaide Oval in the 2019 AFLW Grand Final. Now, the Crows are the only team to win two AFLW premierships. It was the Blues first AFLW grand final. The Crows hosted the Blues at the Adelaide Oval in front of a record crowd of 53, 304. 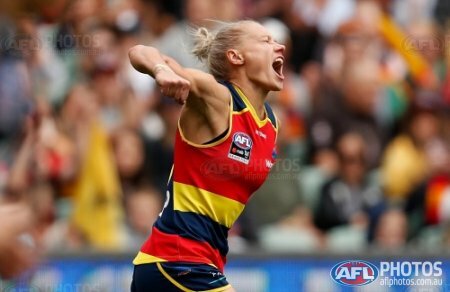 Crows superstar Erin Phillips’ day came to a sad end late in the third term, as she injured her ACL and was stretchered off the ground. Meanwhile, teammate Chloe Scheer tore her ACL in the match as well. Blues star forward Tayla Harris also injured her knee after a knock to it. The opening term was filled with high intensity and pressure. Both teams came out firing in action packed quarter. Young Blue Maddie Prespakis drew first blood, as she kicked the opening goal of the grand final. Anne Hatchard responded quickly with a goal for the Crows and the Crows first. Hatchard manoeuvred her way through the opposition and scored the goal. The tackling pressure from both teams was top-notch. The Irishwoman Ailish Considine slotted through the Crows second goal. Eloise Jones found Hannah Martin in the forward 50 and Martin ran into an open goal. It was the Crows third consecutive goal. The Crows led by nine-points at quarter time. The Crows came out all guns blazing in the second quarter scoring six goals. Stevie Lee Thompson nailed through a nice running goal to open the scoring in the term. Soon after, Phillips joined the Crows goal list after she was given a free kick and she made no mistake in front of goal. Chloe Scheer with some silky skills found teammate Danielle Ponter inside 50 who kicked her first major. The Blues captain Brianna Davey stopped the flow of Crows goal with the Blues first major. Ponter again troubled the scorers with her second goal. Some nice play from Jones as she found her teammate Ponter. 19-year-old, Ponter was in the thick of it once again, as she put through her third goal in the quarter straight through the middle from in front. Jones was everywhere in the second quarter and all her hard work paid off on the siren with her kicking the Crows sixth goal. The crows were up by 40-points at the main break. At the start of the third term, there was a clash of knees between Harris and Davey. Harris came off second best and to the bench. The blues were gaining greater control in the match but could not get any scoring opportunities. Phillips notched up the opening goal of the second half. Not long after scoring the goal, Phillips went down and it did not look good at all for the champ holding her left knee. Phillips was stretchered off the ground to a standing ovation and players from both teams wished her all the best as she was put on the stretcher. The Crows had an advantage of 45-points at three quarter time. In the final stanza neither team scored a goal with a behind scored by each of the teams. The Crows were outstanding today and a sensational second term set up the amazing 45-point win for the Crows. It was a remarkable season for the Crows, they were the best team all year and continue to set the benchmark for the rest of the competition. The Blues improved a lot this season and have lots of positives to take into AFLW 4.0.